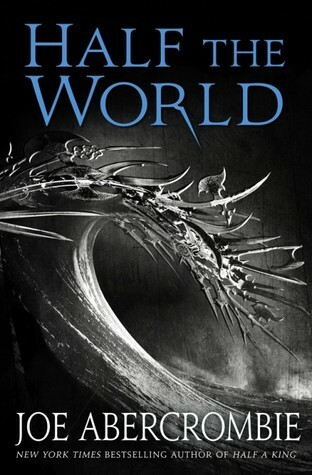 Half the World is the sequel to Half a King, a new YA (more like adult) fantasy series by a seasoned author. It’s good. Really good. I literally ate this puppy up like it was sour gummy worms yum. That Del Rey cover just screams supremely awesome and I prefer this artwork over some of the alternative editions published by Harper Voyager. In the previous book, the focus was on Yarvi and his vengeance against those who have wronged him. He is cunning and deeply manipulative so it was satisfying at every turn how he outsmarted the best players in the game. This time, we are not so lucky have Thorn and Brand, two warriors who may not be as brilliant as the minister but are still deadly with weapons of their choice. BEST PART: One skill that I underestimated Abercrombie in is his dark sense of humor and repulsing hilarious descriptions. The dumb antics of these characters make for some great fodder of fun and the book passed remarkably entertainingly. I loved the how everyone interacted with jibes and poked fun at inappropriate things with good nature. The old woman scraped a spatter of fresh bird-droppings from a post, tested its texture with her thumb, smelled it closely, seemed on the point of tasting it, then decided against and wiped the mess on her ragged cloak. My first reaction at this sentence was appalled shock succeeded by bewildered laughter and then full-blown hysterical laughing. There are some sentences that shouldn’t be that funny but the perfect phrasing it off tickled my funny bone. Just to clarify, Brand had a brief stint dabbling in excessive drinking of alcohol. He also retched up many times after drinking too much. Now about Brand, this kid, he’s one helluva ironic warrior because he’s pretty laidback and he does not truly enjoy sparring. True, he wants to become a warrior but that’s to earn a living and protect the weak. In retrospect, he aspires to be a knight/defender but this world has no place for knights. He has a heart of gold and he’s in actuality very sweet. That’s a surprising aspect because I assumed from the get-go that all the characters are going to be different shades of masterminds. He doesn’t really have a plan and one of the greatest attributes that made him realistic to me is his insecurity. Brand is always doing the admiring and he’s consistently humble despite all his do-good actions and attitude. He’s no arrogant swine and he’s a great addition to the fantasy field where dominant alpha figures are ubiquitous. Again, this is a story that deals with strong themes of heroism, court politics, and games of cat-and-mouse. There’s blood and you’re bound to encounter unhygienic passages that disgust you. But fear not, for there’s the levity and slapstick humor to spice the plot up! “It’s not bad luck if she’s crushed by your bulk,” said Odda. “That is not funny,” said the giant, though judging from the sniggering many of the crew disagreed. “Kalyiv is as a slow-filling bladder,” said Skifr, thoughtfully picking her nose, considering the results, then wiping them on the shoulder of the nearest oarsmen so gently he didn’t even notice.” In spring it swells with northerners, and folk from the empire, and Horse People from across the steppe all swarming here to trade. IN summer it splits its skin and spills filth over the plains. In winter they all move on and it shrivels back to nothing. Aside from that funny action Skifr performed while musing her insights on the town, the writing is really eloquent. And the analogy, come on! You’ve got to give the author kudos for an apt comparison of a bladder to the movements of populations and trades through a town. Oh, and would you look at that, woman power is proven repeatedly through every tribulation and terror! I’ve got a great sense of satisfaction every time Thorn wins or manages to impress everyone. She’s unconventional but that only emphasizes how women are forced to behave as society pleases. She knows she different because every other girl is the same. She does not simper nor does she curtsey. Thank goodness, and along the way, let’s get rid of grooming hairstyles. What would have been a somewhat uneventful journey through the sea, more landmarks, and other countries comes alive in the hands of Abercrombie. The descriptions are rich and succinct, and something is always happening even if it doesn’t seem so. There’s a constant power play and there are sharp minds honing in on taking advantage of seemingly innocuous situations. So if you’re clever enough, you should go ahead and read this book. Here’s a tidbit to pique more of your interest. “Won something no one else would want, she muttered. Oops, and before I forget, you should read the first book Half a King unless you like it out of order, then suit yourself. (Through Netgalley) Thank you, Del Rey Books, for providing me with an e-copy of this novel in exchange for an honest review!